This is a recently renovated detached old house (circa 1850) with stone outbuildings and much character. The light and airy downstairs living space is built on several levels so features a few steps between rooms. The house is set to ensure it stays cool on the hottest of days while the outdoor space follows the sun all day long. Hill House offers a home from home experience. The large kitchen / diner is fully equipped including dishwasher, fridge, freezer and microwave plus dual fuel oven. A separate laundry / cloakroom room includes tumble dryer as well as a washing machine. Two of the bedrooms have ensuite facilities, the third has access to landing shower and toilet. All three bedrooms are upstairs although a second day room with a sofa bed can act as a third bedroom if needed. The master bedroom, with balcony, is situated in the original part of the house and accessed via a staircase off the main living room. The other two bedrooms are accessed via the newer part of the house. The two courtyards around the house provide different options for alfresco dining. The large enclosed south facing garden has great views across the river. Amidst the fruit trees there is space for the patio furniture, sun loungers and suitable setups for BBQ's. Situated between the Bordeaux wine areas and those of Cognac, it is an ideal base for exploring the beauty and heritage of the Charente region and the many nearby ancient villages and market towns.The historic villages of Tusson and Aigre are a short distance away and part of the ancient Camino routes. Tusson can also be reached by a 6km walk across the fields behind the house. La Haute Terne is a quiet, friendly, safe and welcoming community of 26 houses. Luxe is a pretty, traditional village sat on the river. It has a highly rated restaurant; train connections to Paris and Bordeaux; a private fishing lake with lakeside cafe and children's play area, Pharmacie and petrol station with tabac and shop - all within easy walking distance. The Hippodrome race course in Luxe is the venue for many local festive activities all year round along with the horse racing. Riverside Mansle is the nearest town 7 kilometres away with two large supermarkets, a range of restaurants and traditional shops plus kayaking. The nearby market town of Ruffec has a lovely river beach where you can enjoy swimming as well as kayaking / canoeing. Thirty minutes away in region capital Angouleme these leisure opportunities also exist; along with the Nautilus water park which has a range of waterslides, Olympic size pool and is on the same site as a free, large, child-safe swimming lake. An hour's drive also gives you access to other must see attractions including Futuroscope theme park near Poitiers which offers high-tech fun for all the family with many 3D and 4D simulator experiences and evening shows. Limoges, Poitiers and Bordeaux and La Rochelle airports service the area. Limoges and Poitiers are the closest and can be reached in just over 1 hour. The other two in under 2 hours. Good rail and road connections make moving around the area very easy. In particular travelling to Angouleme by train or road. The local station, Luxe Gare, is about a 15 minute walk away. From Anguoleme there are frequent TGV fast connections to and from Paris and Bordeaux. Taxis are available from Mansle and there are buses. However to make the best of your stay a car is essential. The port of Caen is approximately 4.5 hours drive, Dieppe 5.5 hrs and Calais is about 7 hours depending on traffic. It takes 15 minutes from the house to the major N10 route which feeds into the A10 a main auto route from Paris to Bordeaux. The photo above was taken this summer (2017) with me and my two Grandchildren picking fruit from my third of an acre orchard garden.We picked pears, apples, plums and greengages. The dogs are mine too on their first trip to France and loving the freedom! I have loved France for many years but mostly knew the South particularly around Grasse and the south coast. I had been looking for the right property for me to buy for over 12 months. I started in the north Dordogne but just couldn't find the house that matched my dream. I started to look in the Charente and was fascinated by the river and all the villages along it. I was delighted with Ruffec a beautiful classic French market town. I was enthralled by Verteuil sur Charente and needed to be close. I saw 6 different houses in two days, two in Luxe, but fell in love with this one ... The Maison Colline. Actually it was the garden and the view from it - the Charente river and surrounding countryside - that thrilled me at first sight. When I finally pulled myself away to go into the house I was enchanted. It's hard to put into words why this house is so special. It's old - circa 1850's - but beautifully renovated. It is light and spacious without loosing its character and original features. It embraces our micro-climate sun all day long yet stays cool and comfortable. The neighbourhood is also delightful, picturesque, inviting and friendly, Circumstances don't allow me to live here all year round. Although I would happily do so. Everything you need is in easy reach. Room enough to lose yourself but close enough to busy places should you chose to join in. I am pleased to be able to share my house with you. You'll see why I love it. It's the house that just keeps giving. I look forward to getting your feedback Enjoy !! From a comfort point of view all three bedrooms have access to their own bathroom facilities ... two bedrooms have ensuites. So no fights in the morning. The kitchen provides everything you need including plenty of space to cook and eat together. The outside space is also highly versatile with various locations allowing for eating in the shade or under the stars.Parking is not a problem but you wont need your car to enjoy some of the beautiful photo opportunities on the doorstep. Both the bedroom ensuites and landing facilities are fully tiled and fitted to a very high specification. Fireplace houses large wood burner. Logs can be provided when required. Wood burner in fireplace of main lounge. Two rooms - lounge and day room with combined seating for 8 people. The configuration can be adjusted according to needs. The day room contains double sofa bed. More than adequately provided for. Includes garlic crushers and several wine bottle openers!. Hard to get screw tops in France! Kitchen is fully equipped with everything you will need including food processor! It is very much home from home with ample dining for 6-8 people, There is plenty of crockery, cutlery and glassware. Sky box connected to UK Freesat service. Not at the house but boat hire to cruise the Charente is available many of the local towns. Ruffec at 15 kilometres is the nearest. Patio / terrace area in main orchard garden is a great place to eat and take in the beautiful surroundings. There are also various outdoor eating options in courtyards surrounding house. Not at the house but public facilities available in nearest town Mansle. Mansle is under 15 minutes away in a car. A stunning detached stone property with outbuildings situated in the beautiful Charente countryside. Private and both child and pet friendly, it is a great place to stay, offering quiet calm and a base for exploring the many nearby ancient villages and market towns. The house is fully equipped and close to a range of amenities. Four airports are within a two hour drive along with excellent train connections from Bordeaux and Paris. La Haute Terne is a quiet, friendly, safe and welcoming community of 26 houses. 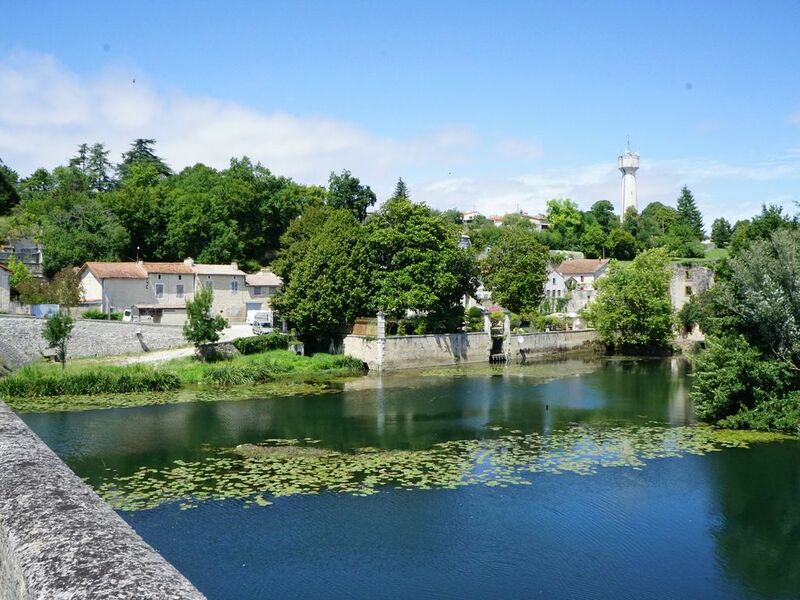 Luxe is a pretty, traditional village sat on the beautiful Charente River. It has a highly regarded restaurant; train connections to Paris and Bordeaux; a private fishing lake with lakeside cafe and children's play area; Pharmacie and petrol station with tabac and shop. All within walking distance. The Hippodrome race course in Luxe is the venue for many local festive activities all year round along with the horse racing. spacious, well equipped property full of character. clean well equipped property with plenty of space. It is in a quiet hamlet, a short walk to the bar, restaurants, convenience shop and railway station. Our party comprised of 4 adults, who had come to see the motor racing at nearby Angouleme, so we appreciated the space and especially the showers and toilets. We only eat out once, at the nearby lake bar and restaurant, so did a fair amount of self catering where we found the property's cooker, pots, pans,utensils, crockery and dishwasher, well up for the job. We all enjoyed staying here and would recommend it to anyone. We loved this house. It's old, but has been modernised; has a huge garden overlooking ruins, bridge and river Charente. Numerous outside eating locations. Is in a pretty but not over-touristy area, with an excellent restaurant in the nearby village. We enjoyed visiting cities of Cognac and Angouleme, and further away the coast at wonderful Ile de Re. Thank you Steve. Delighted you and Terry enjoyed your stay and that you got a chance to sample some of the beautiful features of this fascinating area. Perfect base to explore the Charante area, we had a wonderful time catching up with family and friends. The house was warm, clean and very comfortable, typically French, with lovely outside spaces. The verandah off the main bedroom has an amazing view of the river. Cognac and Angoleme are an easy drive away, beautiful walks can be taken around the river and local area. Lin was a great host who gave us full information on the house and location prior to arrival. Lovely place to stay with friend or family. Kitchen is well equipped, nice dining room, great location for exploring the area. Doggie friendly. Garden is opposite across a very quiet road. Highly recommended. This is a glorious area to explore. Away from the summer traffic, in the tranquil undulating countryside of the Charente River Valley and its micro climate, there is a whole new experience waiting. Whatever your interests, there is something for you. Whether it's fishing (a renowned lake is within walking distance), cycling, walking, horse riding or kayaking it is all on the doorstep. Maybe you want to visit historical buildings, chateaux, abbeys, beautiful medieval villages and great restaurants. It is all here too. You can follow St Jacques path to Santiago the 'French Way'. Surrounded by the manufacturers of Cognac, Pineau and classic wines who can resist a sample or two? Contact us an tell us how you would like to spend your time in this glorious part of the world and we will work really hard to make it happen.